Here is a picture of Sassafras (now deceased), the Project CALC mascot, who was born about the time the project got under way. 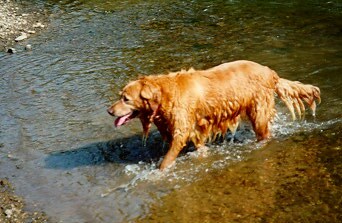 Her favorite pasttime wais playing in the water, and she is shown here emerging from the New River in Boone, NC. This picture was taken on Fourth of July weekend, 1997. A month later Sassy moved to Elizabeth City, NC -- where there is a lot more water. Sassy played the lead in our Puppy Growth lab and in Project 1 at the end of Chapter 7 in our textbook.